“She has a string of live dates lined up throughout the summer and onwards, with hopefully the intention to keep writing and interpreting new songs to one day, be in a position to add to her catalogue of recordings.” These were the words that closed our review of Kim Lowings back in May and it was great to catch up with her and the band on this Birmingham date after a busy summer period. This included a prestigious opening slot at the Warwick Folk Festival, a residency at an Edinburgh Fringe venue and some extended recent coverage on Genevieve Tudor’s Sunday Folk show on BBC Radio Shropshire. The good news is also that new songs are taking shape and hopefully some of these will begin to surface in the New Year. For this show at Birmingham’s eclectic Ort Café in the inner city suburb of Balsall Heath, it was very much business as usual for Kim as she served up her regular offering of intriguing interpretations of traditional numbers and plenty of innovative originals. 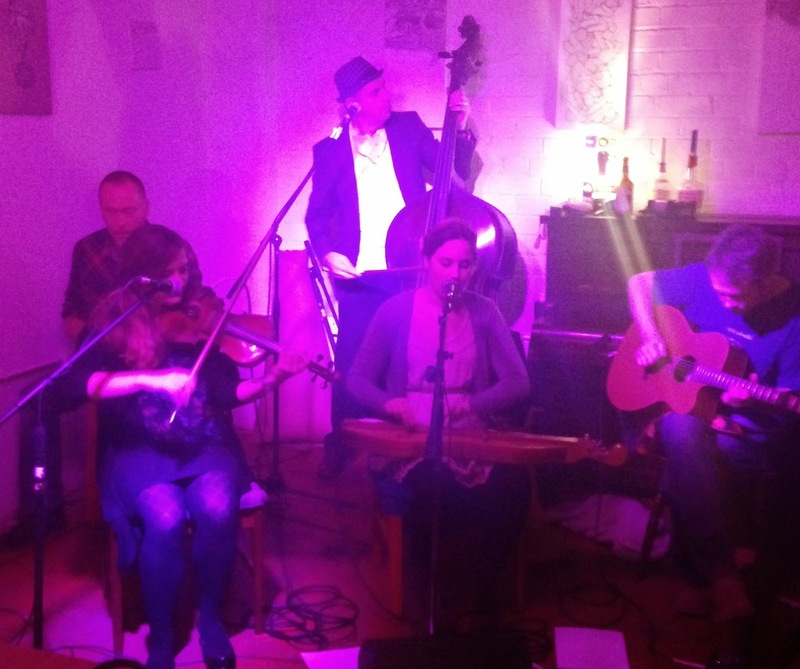 One enhancement following that Stourbridge gig in the final days of spring was the return of Ami Oprenova on fiddle to give the Greenwood collective a more complete feel. 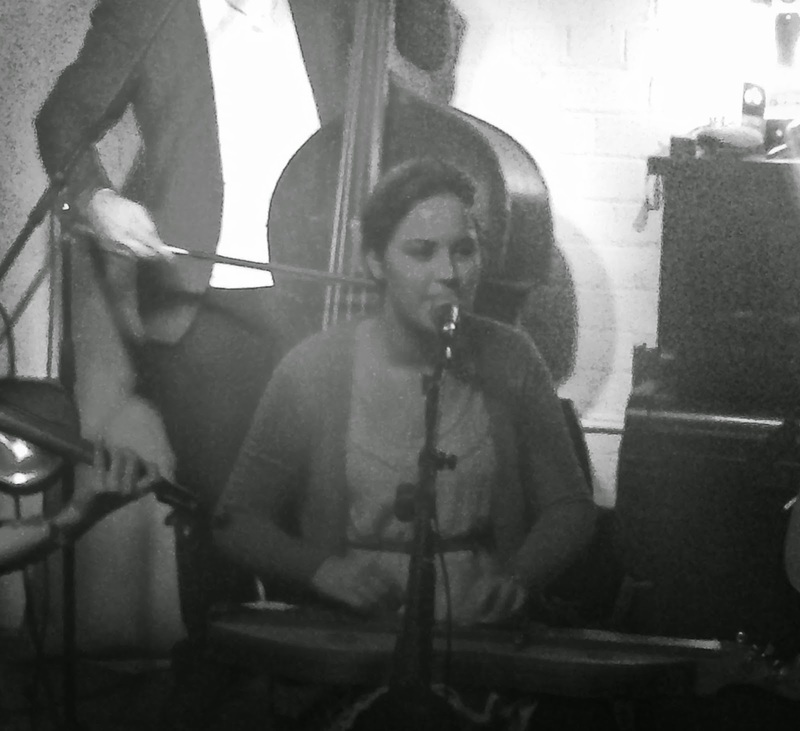 She joined the usual combo of Andrew Lowings (guitar/bouzouki), Tim Rogers (cajon) and Dave Sutherland (double bass) with Kim confining herself to her favoured mountain dulcimer on this occasion. Together they produce a tight knit sound to present authentic roots music at its soul searching best. A niggling minor ailment curtailed a few of Kim’s more vocal experimental songs on an evening promoted by Best Seat Sessions which presented local singer songwriter Malc Evans as the opening act. Kim soon hit her stride for a set lasting just over an hour with any temporary impediment being disguised in true professional style. A trio of her finest originals, ‘The Allotment’, ‘Off to Sea’ and ‘Deepest Darkest Night’ sounded as good as ever along with her memorable renditions of ‘The Devil and the Ploughman’ and ‘The Bonny Labouring Boy’. For your musical record, Kim Lowings hails from the ‘creative hotbed’ of Stourbridge West Midlands, was schooled at the acclaimed Dartington College of Arts and to date has two major physical releases to showcase her vibrant and accomplished brand of folk music meeting the approval of both contemporary and traditional audiences. Sales of the debut album THIS LIFE have nearly depleted stocks of the initial production batch; while the four track EP DEEPEST DARKEST NIGHT is the perfect taster for people wanting to dip their toes into folk music. Alternatively Kim and the band are active in the digital world with a highly recommended live recording of ‘Annie Laurie’ being available on the world’s favourite video sharing site. While this interim feature is designed to keep the flame flickering for Kim’s tried and trusted material, anticipation is growing to file some column inches on the next phase of Kim Lowings and the Greenwood. In the meantime there are still a number of Midland dates before the winter sets in including a support slot at the Kitchen Garden Café opening for BBC Radio 2 award nominees Josienne Clark and Ben Walker. Whether catching one of their live shows or sampling the recordings, marking the card of Kim Lowings and the Greenwood is a choice well worth making.